This book is for kids who struggle with body image. Included is a fairy tale about a "Mirror Witch" who puts a spell on children, getting them to hate their bodies. 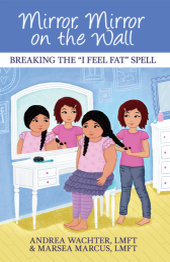 There are 22 chapters, or "Spell Breakers," which empower kids to question and change their thinking while learning how to love their bodies and break the "I Feel Fat" Spell. While this book was written for kids, we have also discovered that many adults are finding it to be extremely helpful, if not life-changing. "Describing a problem is easy; coming up with creative and effective solutions is the real challenge. With a foundation of one deceptively simple metaphor, Wachter and Marcus build a book for young people that is almost all solution. But kids aren't the only beneficiaries here. Adults with body image problems would be wise to learn the 'Spell Breakers' in this book." "In Mirror, Mirror on the Wall: Breaking the "I Feel Fat" Spell, Wachter and Marcus have created a great offering for an important population. Mirror, Mirror seeks to soothe self-doubt and body image anxiety in kids before they fall prey to disordered eating. The authors talk to the reader in a direct manner that cultivates educated understanding while also encouraging self-reflection and healthier thinking. Just as crucially, they help adults interact with kids using kid-friendly language and concepts. This is an upbeat, solution-oriented book that will make a positive impact on kids and parents alike." "Mirror, Mirror on the Wall: Breaking the "I Feel Fat" Spell brings new insight to an issue that is becoming more and more confusing and heartbreaking for parents and kids. The authors speak with families and not at them. Each 'Spell Breaker' gives parents the tools they need to work with their kids and help them develop the self-esteem they deserve. Kids don't have to suffer in silence and parents don't have to feel powerless. I think this book will be a life changer for many families." This unique workbook is full of in-depth information, moving personal stories, and insightful writing exercises to help people understand and resolve their food, weight and body issues. 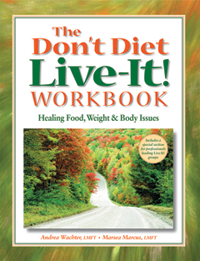 Individuals and groups, world-wide, are using The Don't Diet, Live-It Workbook as a healing guide and now you can too! Reviews for Don't Diet, Live-it! "The Don't Diet, Live-It Workbook contains so much insight, compassion and guidance to help women of all ages on their journeys to establish a healthy relationship with food and their bodies. A must read!" "Having reviewed a lot of books like this one, The Don't Diet, Live-It Workbook is one of the clearest, most practical and useful books I've ever seen." "The Don't Diet, Live-It Workbook offers a refreshing approach to becoming your ideal weight while healing related issues in the process. Participating in the exercises is like attending an in-depth workshop. The true-to-life experiences and insights offered are extremely valuable and apply to all areas of life. I highly recommend this book to anyone wanting to delve deep within and remove blockages to self acceptance. Andrea Wachter and Marsea Marcus give openly of themselves by sharing intimate details of their processes and struggles to recovery. With this self-help book the reader could easily achieve the goals outlined and have more compassion with themselves regarding their food and body issues." "Wachter offers sound information from a variety of approaches and addresses the core issues of feelings, food, body image, and much more. Written in language that is easy to understand and insightful for girls and boys, this workbook is terrifically practical. It is the best resource I've ever seen on this subject for teens." "In a language appealing to teens, Andrea Wachter has created a book that can help readers navigate their way through the challenges of adolescence, without turning to food. Teens will relate to the catchy titles of chapters and thought-provoking exercises, which can motivate them to deeply explore their emotions and strengthen their coping mechanisms. 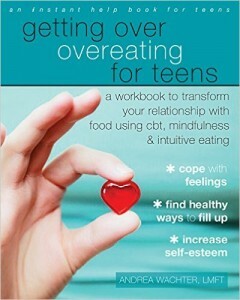 This workbook is a must-have for professionals treating teens and for the teens themselves." "You can rediscover a mindful and joyful relationship with food, your body, and your feelings. Give yourself the gift of self-compassion, and learn to listen to your body's inner wisdom again. This book will show you how." Both of these low-cost courses are available exclusively through the Insight Timer app. Anti-Anorexia Podcast: For anyone who is trying to overcome dieting, restricting and/or anorexia. Bulimia-Buster Podcast: For anyone who is trying to overcome dieting, bingeing or purging. Binge-Buster Podcast: For anyone who is trying to overcome dieting, overeating or bingeing. Stress Less Meditation: This 15-minute guided meditation (for all ages) helps decrease the stress that can lead to overeating. Kind Mind Meditation: This 15-minute guided meditation (for all ages) helps improve body image. Getting Over Overeating Podcast: 12-minutes of healthy messages for anyone struggling with overeating or binge eating. This 17-minute talk will teach you how to do your part in making some positive body image changes for yourself and the people in your life. This 20-minute meditation is for anyone struggling with the painful cycle of dieting and overeating. This 18-minute guided meditation will help you quiet your mind, calm your body and soothe your nervous system. Andrea teaches the four components of a Live-It in this one-hour class.